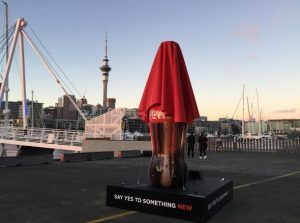 The global rollout of Coke No Sugar will be the biggest launch of a new Coca-Cola since Coke Zero was introduced in 2006 and New Zealand is one of the first countries in the world to try the new beverage. It will be available in stores nationally from June 12, 2017 in all major and independent retailers. The new product will continue to roll out to other markets later this year. The taste experts at Coca‑Cola HQ in the US have been quietly blending the flavours of this exciting new recipe for more than five years. Their job was to create a Coke that tastes even more like classic Coca-Cola but without any sugar. “More than three decades ago we launched our first sugar-free Coke and we’ve been working on perfecting our no sugar recipes ever since. With the launch of Diet Coke in 1983 New Zealand enjoyed its first ever lighter taste of sugar free Coca-Cola. Then came Coke Zero, launched with great success in 2006 – a refreshing step closer toward the unmistakable Coke taste without any sugar whatsoever. “We wanted the experience of drinking Coke No Sugar to be as close as possible to the ‘real thing’,” Sandhya Pillay, Country Manager of Coca-Cola Oceania said. “That’s no small task when you consider the original taste is so well-known and has been around for over 130 years. “Faced with this challenge, our team of taste experts spent five years mixing different flavours and conducting 18 separate consumer trials before finally cracking it. “We believe the new Coke No Sugar is the best tasting sugar-free cola we’ve made,” says Pillay. Coca-Cola No Sugar is sweetened with the same sugar alternatives as Coke Zero and Diet Coke, but the key difference is due to further optimisation of the flavours. Coca-Cola No Sugar is sweetened with aspartame and Acesulphame Potassium (sometimes called Acesulphame-K or Ace-K).